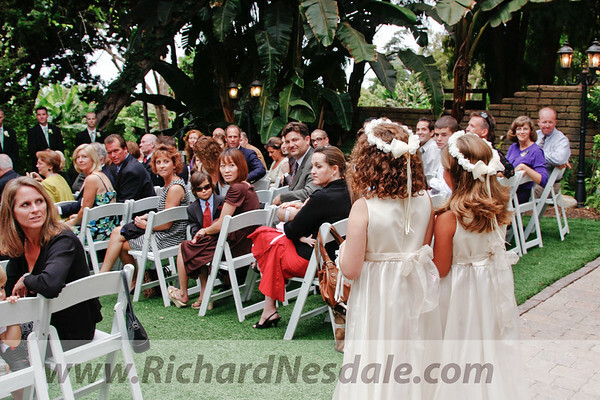 Email me Richard enjoys creating San Diego wedding photography, confirmations, baptisms and bar mitzvahs, He uses candid photojournalism styles (color, B+W, sepia) at premier locations in San Diego County. These include the Hotel Del Coronado,The Grand Tradition, The Immaculatta at USD, Harbor Excursions, UCSD, Hornblower Yachts, The Catamaran, The Four Seasons, Marriot, Hyatt, Hilton, and Sheraton Hotels as well as The Prado in Balboa Park. Richard's familiarity with these places yield benefits in that he has favorite spots in each where the background and light is just right to capture highlights of your special day. Using fast, light, high resolution Canon cameras, Richard is able to capture as many as 750 clear, sharp and spontaneous images at every event. In this way the story is told, and details, small and large are captured to be enjoyed for years to come. Taking pictures should be fun. Richard works quickly, politely and unobtrusively to capture images that are sometimes formal, other times candid while always being respectful of the limited time available on your special day.All photos copyrighted. All rights reserved.